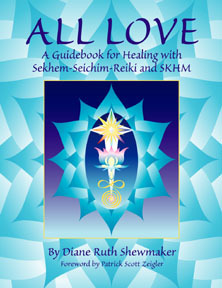 ALL LOVE: A Guidebook for Healing with Sekhem-Seichim-Reiki and SKHM by Diane Ruth Shewmaker, with a Forward by Patrick Scott Zeigler. For the first time since 1979 when Patrick Zeigler received his spontaneous initiation to the SKHM energy stream in the Great Pyramid in Egypt, there is an authoritative source for information and a guide for using the remarkable universal healing energy known as Sekhem-Seichim-Reiki (SSR) and SKHM. ALL LOVE is an inspiring and easy to follow book for learning about energetic healing, the miraculous power of the human energy system, and the specific tools for healing and spiritual growth that are a part of SSR and SKHM. ALL LOVE opens the door to a journey that allows us to recapture our joyful connection to the Divine and teaches us how to share it with others. 81/2" x 11", illustrated, softcover, ISBN 0-9674135-1-6, 192 pages, each $18.95 U.S.
Diane Ruth Shewmaker has a gift for taking esoteric principles and making them very understandable. ALL LOVE is extremely well-organized and is a valuable resource for everyone who is interested in spiritual healing practices. ALL LOVE is a wonderfully clear exploration of the intricate beauty of spiritual healing and the profound relationship that exists between "healer" and client. It provides both an easy to understand introduction to energy work as well as fascinating details about the sacred nature and practical application of the ancient healing energy known as Sekhem-Seichim-Reiki and SKHM. This is a powerful book for both newcomers and masters of all schools of spiritual healing. The angels are applauding! I have been a healer-teacher for many years. The information, insights and deep knowledge in this book are a must to read and utilize for the daily work of a healer. I feel this wisdom has come through a pure channel of the Sekhem-Seichim-Reiki and SKHM vibration. I have had the distinct honor of co-teaching with Diane and experiencing firsthand the desire she has to help people on their spiritual paths. Writing a book is no easy matter. It takes dedication and a love of sharing knowledge to open gateways for people to explore on a deep spiritual level who they can be, for themselves and for others. This book is one of those tools that should be on every healer's shelf as well in the libraries of those who are just taking their first steps in understanding healing energy, and the underlying truth that when it is all written and said--it is truly--ALL LOVE. Diane Shewmaker's gentle, clear energy and her professional background in therapeutic counseling, along with her thorough knowledge of the ancient energetic healing systems of Sekhem-Seichim-Reiki and SKHM, ensures that this is a remarkably clear and useful book for those wishing to learn about this powerful energy healing system and how it can be put to use. 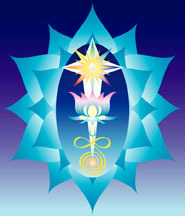 I discovered Sekhem-Seichim-Reiki in 1997 over the course of three sessions with gifted catalyst Diane Shewmaker. The first encounter in her healing studio was an unforgettable awakening to the power of energy healing. I experienced a profound impact on all levels as the karmic roots of a long-standing health issue all at once became clear to me. A physical healing resulted. Sekhem-Seichim-Reiki is a powerful healing technology and Diane Shewmaker is a rare kind of healer. With compassionate non-judgment she leads clients on a journey deep into the heart and its myriad wounds, where the keys to self-healing lie. This book is a gift for healers everywhere. It is filled with clear, practical advice in negotiating the business aspects of a healing arts practice, while honoring spirit in all that we do. © 1999, Patrick Scott Zeigler and Diane Ruth Shewmaker. All Rights Reserved. Computer graphics by Lesley Stoune. "Shenu" is an Egyptian word meaning "that which encircles." The basic design of the SKHM Shenu was first conceived and designed by Patrick Zeigler in 1996 as a depiction of the infiinite SKHM energy stream that he rediscovered as part of a spontaneous intiation experience in the Great Pyramid of Egypt in 1979. With Patrick's blessing, the original design of the shenu has recently been enhanced through spiritual inspiration and a collaborative effort that included Patrick, Lesley Stoune, Ann Lucabaugh and myself. 8" x 10" Shenu Print: The SKHM Shenu is printed in full color with a description and instructions for its use in meditation printed on the back. This beautiful image is laminated and is also suitable for framing. Each $8 U.S.
18" x 24" Shenu Poster: This image is printed in full color and mailed in a protective cardboard tube. Suitable for framing. Each $20 U.S.
ALL LOVE FOR TEACHERS: A Manual for Teaching Sekhem-Seichim-Reiki and SKHM by Diane Ruth Shewmaker. This companion volume is a working resource for SSR and SKHM teachers and provides further training and class materials for those who wish to expand their energy healing practices to teaching SSR and SKHM. 8 1/2" x 11", illustrated, spiral bound, ISBN 0-9674135-0-8, each $18.95 U.S. Watch this site for continuing updates of the availability of this book. Watch this site for continuing updates of the availability of these items.